Count not the candles See the light they give! Count not the years But the life you live! Wishing you a wonderful time ahead! Happy Birthday! May this birthday be filled with lots of happy hours and also your life with many happy birthdays, that are yet to come. Happy Birthday wishes. Let’s light the candles and celebrate this special day of your life. Happy Birthday wishes. May this day be as special as you, filled with flowers and good memories I wish you the best day of your life Happy Birthday Wishes to my Dearest Sister! Although I never really enjoyed sharing my things with you I have always enjoyed sharing our childhood and love for each other.You’re most precious to me. Happy Birthday, sister! I was scared sleeping alone in the night but you’re always there by my side, protecting me always. Thank you for being such a lovely sister and a very happy birthday. I can’t count the feelings I have for you but the best one is the love that we always shared.Happy birthday and have a brilliant year ahead! Thank you for bringing so much fun in my life.Happy birthday, dear sister! Wish you a day filled with happiness, fun, laughter and love. Enjoy your special day of life as you will have to want till next year for this day! Happy Birthday Wishes Sister! You are the best Brother not for now, not for today, not for tomorrow – but forever. Happy Birthday. My love and patience will never run out when it comes to you dear brother. Happy Birthday Wishes! A Brother’s love is a hundred times better than all of the world’s treasure. And I’m not saying that just because it’s your birthday! Nothing in this world can come close to a brother’s love and companionship. I am looking forward to your Birthday celebration. The best part of having a naughty little brother like you is that I can blame you for almost everything. Happy Birthday Wishes Brother. My strength does not come from a big bank balance or a cool set of wheels. My strength comes from a big brother like you, who supports me like a pillar of steel. Happy Birthday brother! Regardless of our occasional arguments, you occupy very special place in my heart. I love you so dearly because you are such a loving and selfless brother. Happy Birthday! My love and patience will never run out when it comes to you dear brother.Happy Birthday Wishes! It is my fervent wish that you get what you wish for on your special day. Happy Birthday Wishes, Brother! You are a blessing from above— a person who has made my younger years more exciting, fruitful and challenging. Happy Birthday Wishes , Brother! May you be blessed during your birthday and even after. I wish you good health, lots of love and success in life brother. Happy Birthday Wishes! There is a special bond between us that will never be taken away no matter where we go, how far we live from each other and how many ups and downs in life we go through. Happy Birthday Wishes, dear brother! A mother is a wonderful combination of warmth, kindness, laughter and love. This should be rewarded with a special Birthday Message that makes your Mom feel as special as she makes you feel. 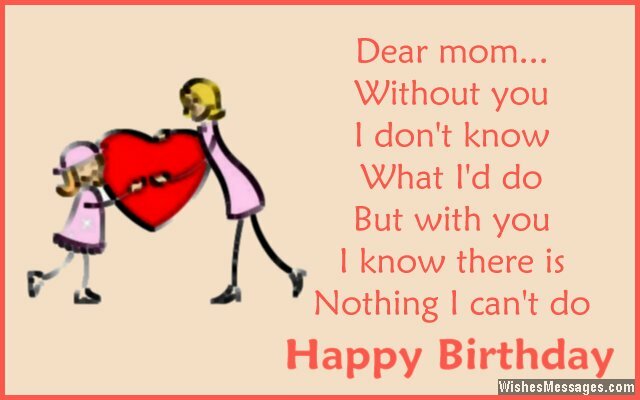 When choosing a message, make it as heartfelt as possible, Following are some of good collection of Birthday wishes messages for mother, which you can share with your mom. Think of what a joy she will feel when when she opens her email/facebook on her birthday and finds a message from you. Even if you will not be there on the special day, this message will show how much you love her and think of her. Mother is everything, she is the first person to know you, she teach and guide us, no one can love us like our mother does. Nobody in the world can define the meaning of a mother, she makes our lifes beautiful. By wishing our Mom beautiful birthday wishes for her birthday we tell her how much we love and admire her. You were my very first friend and you are still my best friend. You are the best mother a daughter could ever hope to have. Wishing you all the best today and always! You’ve helped me enrich my life with your love, care, guidance and support! You are not just my Mom but my best friend too! thank you for everything… & Very Happy Birthday Wishes to you! I Love you! Thinking warm thoughts of you , Mom, and wishing you a day that’s as special as you are! You are all these and much more to me! I am really lucky to have a mom like you! Happy Birthday Wishes Mom! Words are not enough to express the gratitude that you deserve for all that you have done for us throughout the years. Happy Birthday Wishes Mom!! My Relationship with you is so much more than I ever knew it would be. You are a wonderful person & the perfect Mother for me! Happy Birthday Wishes to you! It is difficult to make a greeting and birthday wish for someone so kind, humble, gentle, generous and loving. Mom you are the best in the whole world! Happy Birthday Wishes! You Have shown me so much Love Nd support I can Proudly tell the world, “Yeah! I have the Best Mother on the planet!“ Happy Birthday, mother! On your birthday we wish for you that whatever you want most in life it comes to you, just the way you imagined it, or better: Happy Birthday Wishes! Mothers like you are made in heaven. If I had to take birth on earth for a thousand times, I would wish that you would be my mother each time. Happy Birthday Wishes mom! You are the one who made my childhood special , and I remember every minute of it. Thanks to you, Mom I wish you a very warm and happy birthday. May God pour all the love and warmth on you. Whenever I count My Blessings I Count You Twice Thanks For Always Being There for Me.. You are the Best MOTHER I Am Lucky to Have You! Happy Birthday, Mom.